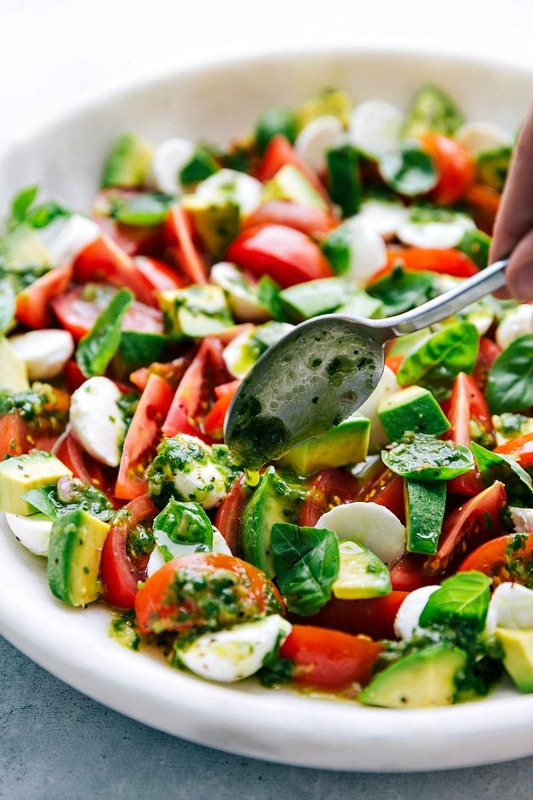 A delicious take on the famous Italian Caprese Salad with a simple basil dressing. I’ve shared a little bit about our trip to Italy this Spring and how inspired I’ve been by Italian ingredients and cuisine. We were able to take a few cooking classes in the cities we stayed in and our favorite was a class in Siena. The class was in the upstairs kitchen of a farmhouse owned by a very lively Italian grandma. She taught us how to make several authentic Italian dishes (including a caprese salad which served as the inspiration for this recipe!) and shared tips and tricks that have come from a lifetime of learning (and owning a restaurant). Her very first “lesson” for us was all about ingredients. She very emphatically told us the importance of using good quality, authentic ingredients. For homemade pasta, it is a “must” to have 00 “Tipo” Flour. While she said getting the best ingredients can often be more costly, the ingredients are what makes the food amazing. And with high quality ingredients, you can use fewer overall ingredients and still create amazing masterpieces. Each dish we made focused on high quality Italian-made ingredients. 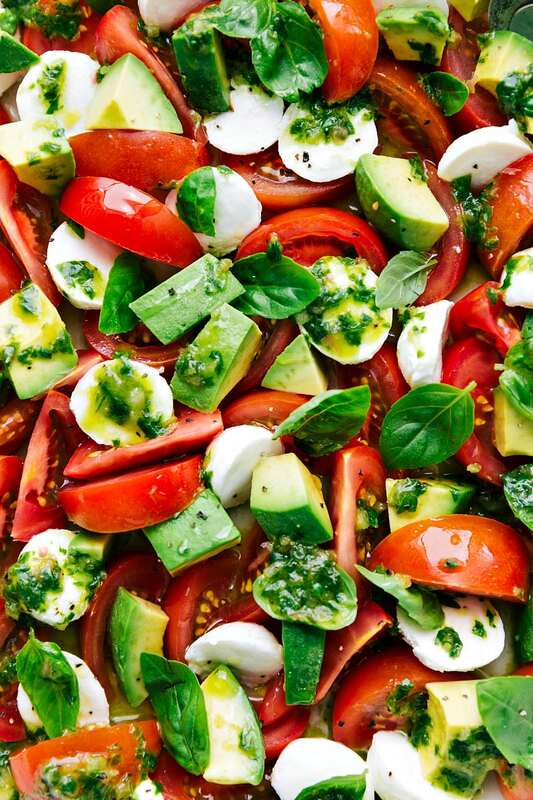 The more I’ve practiced homemade pizza, pasta, gelato, this caprese salad, and other recipes we learned in Italy, the more I recognize what a difference high-quality ingredients make! Authentic Italian products have made such a difference in my cooking. 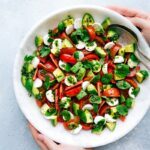 Especially for salad dressings – and that certainly holds true for the dressings for this caprese salad. For this caprese salad I’m using Mozzarella di Bufala Campana PDO and Italian Extra Virgin Olive Oil (PDO/IGP) for the dressing. It makes a world of difference in a salad with so few ingredients 🙂 Other than that I’ve got some garden fresh basil (and if you know about my BLACK thumb, then you know I couldn’t have possibly grown it haha! I have my husband to thank for that) and garden fresh tomatoes. 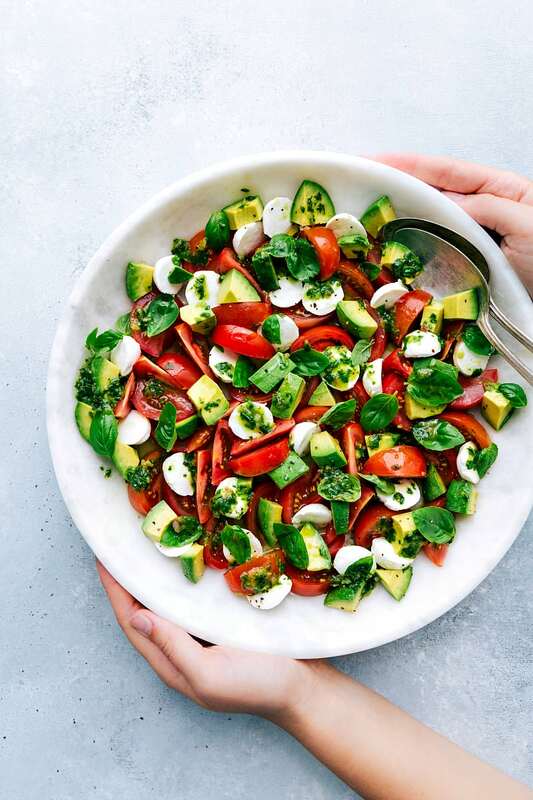 Add in an avocado and you’ve got a delicious variation on the classic Caprese salad. In a food processor, pulse the garlic and shallot a few times. Add the basil and pulse until finely chopped. Add the red wine vinegar, fresh lemon juice, and salt + pepper to taste (I use about 1/2 teaspoon of salt and 1/4 teaspoon pepper). Slice the tomatoes and add to a large bowl. Cut the mozzarella into small pieces and add to the bowl. Tear the basil and add on top. Remove the skin and pit of an avocado and then chop. Add to the bowl (I like to add a squeeze of lemon to the avocado to keep it from browning). 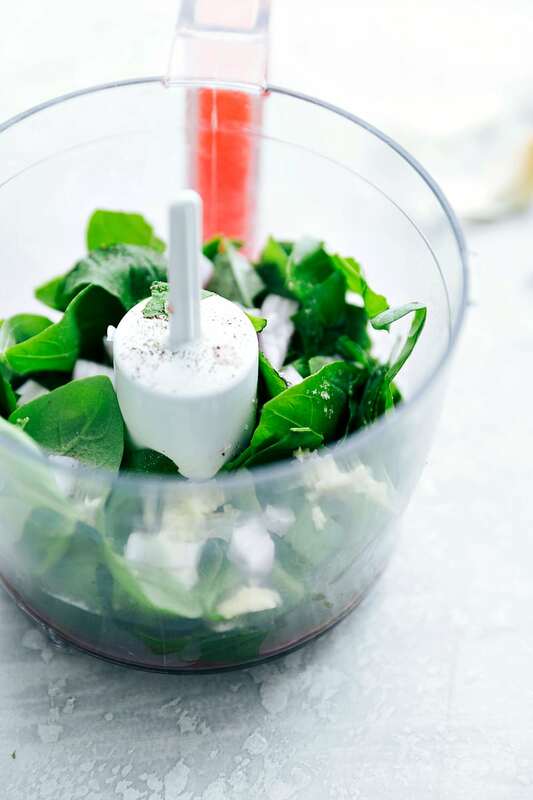 Dress the salad with the basil dressing to taste. Add additional salt and pepper if needed. Enjoy the same day this salad is made. (Leftovers do not keep well). That looks AMAZING! We have so much basil in our garden right now, I can’t wait to make this! This looks delicious! In the ingredients list for the dressing, it says red wine vinegar, but in the instructions, it says balsamic vinegar…which is it? Thank you! So sorry for the confusion, it’s red wine vinegar!